So you want to get started with Bounty Train, but don’t know what’s important and what isn’t? 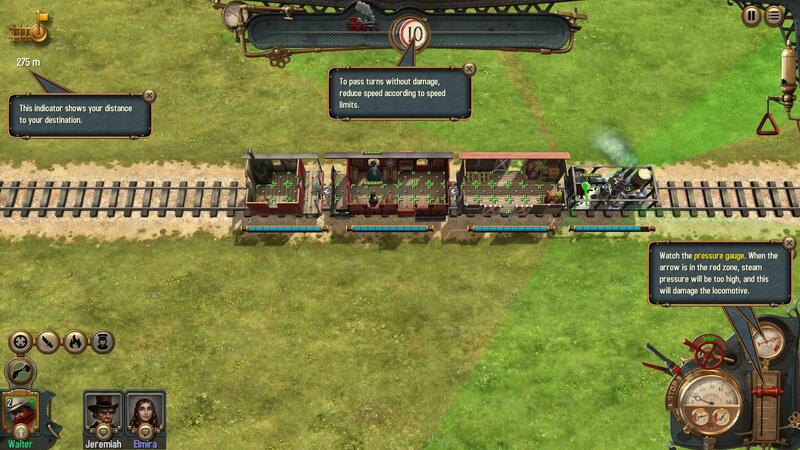 This guide aims to help you learn the ropes of being a train entrepreneur in Bounty Train! 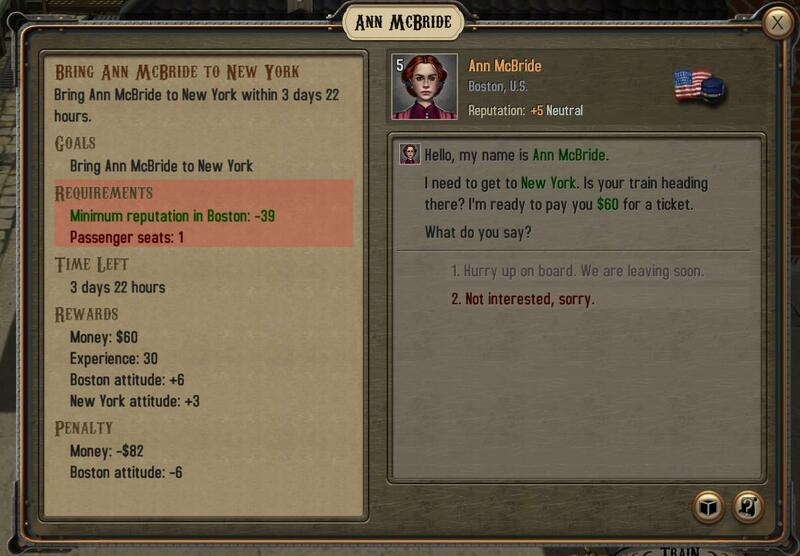 You might not think talking would be very important when building a train empire, but you’d be wrong! 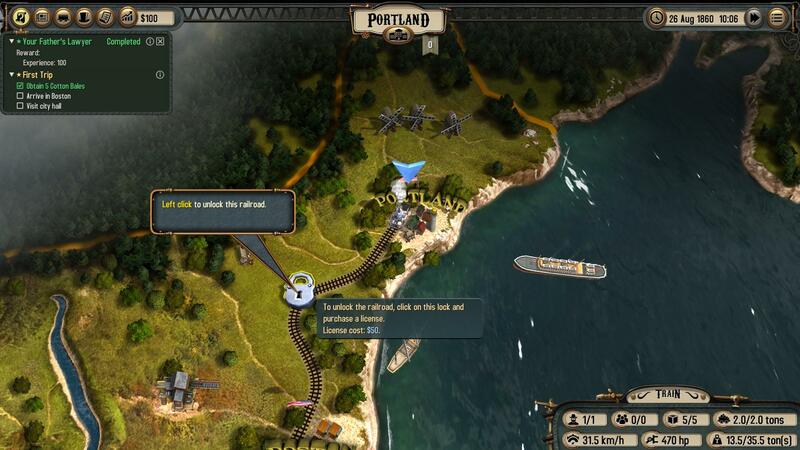 You start the game at the Portland Train Station, where you’ll get your first train and your first quest. 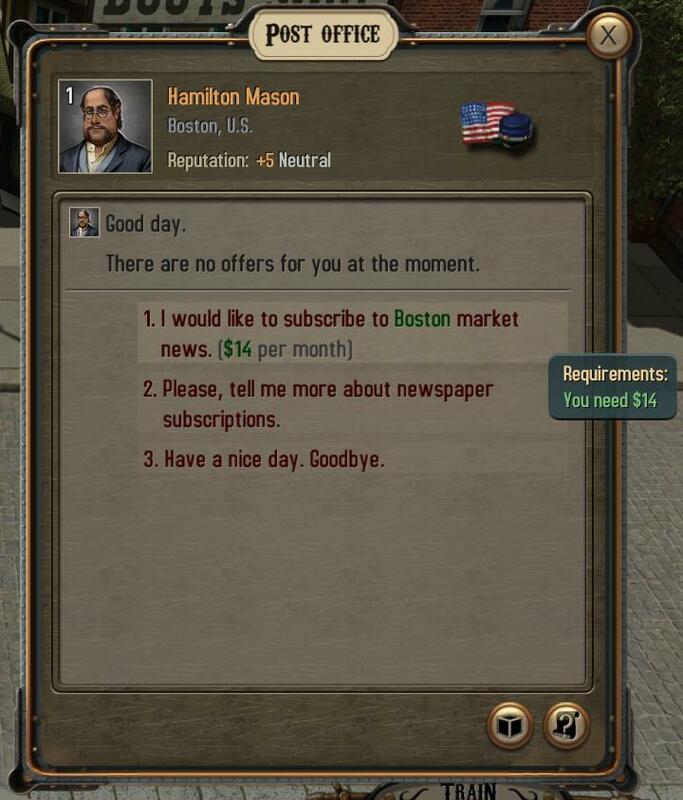 Your first quest is to go to Boston. For every train route, you’ll need the appropriate license. Some may be opened through quests or other means, but usually you will have to buy them. Not every city has the same things to sell, or offers the same services. But every city has a Station, a City Hall, a Post Office, a Market and a Depot. You should avoid empty tours, because they only cost time and coal. 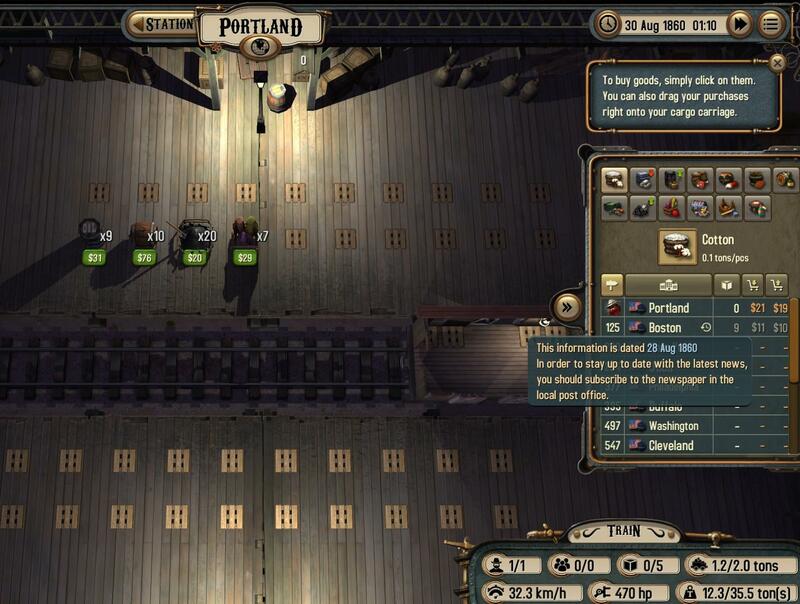 Your best – and first – option is to take cargo. There are a few things you’ll have to consider. This is the Market. On the top side you can see what’s for sale in the current city. On the right, you’ll find an overview of prices. This is very important: In this picture, you can see that Cotton is much more expensive in Portland than it is in Boston, so it looks like a good option to pick up Cotton in Boston and deliver that to Portland. You can also see that this information is two days old. If you want to be up to date, you can always buy a newspaper subscription at the Post Office – but this will cost you monthly. If you buy cargo, make sure that it too heavy for your train engine. You should always look to take the most profitable cargo. … but don’t let profit blind you! Some goods are prohibited in some cities, and you’ll get in trouble for bringing these into town. The cities where the cargo is prohibited are marked with a red exclamation mark. If you have a passenger wagon, you can also take passengers from one city to another. These will pay a good amount of money to arrive in time, so make sure to be on time, or your reputation will suffer. Before you take on a passenger, you should always double check that you can make it to the destination in time, because while the benefits are great, the penalty stings hard, too. 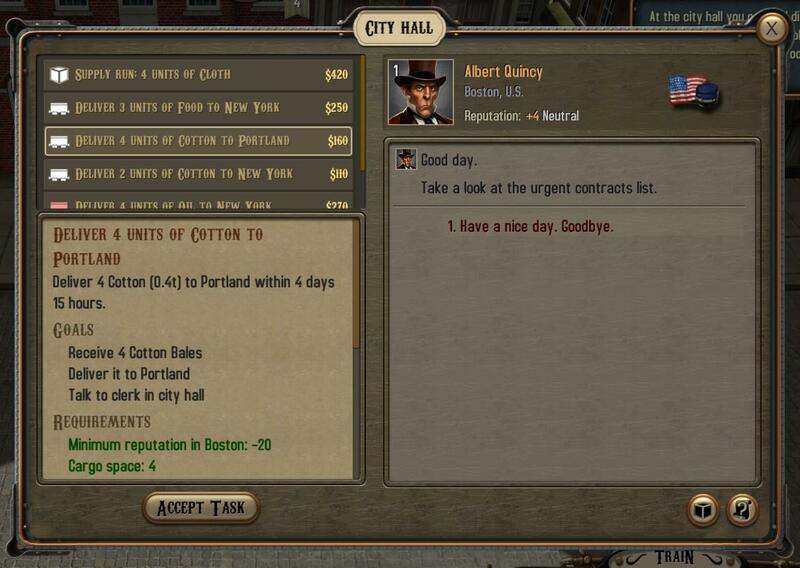 Another good way to earn money is to take contracts from a City. These can be found at City Hall and will require you to either deliver cargo from the City to another or to get some goods for the City. Contracts pay well and increase your reputation, but also have a time limit and are fined if you fail them, so as always: choose carefully what jobs you take. Time to think bigger! Your little engine won’t last you very long, so it’s time to think about getting a better train. You can do so at the Depot, where you’ll find wagons and engines for sale. These will differ from city to city and over time, newer models might be available. There are cabooses for your crew, passenger wagons, cargo wagons and train engines. If you have bought a wagon that you don’t want to use any more, you can park them at the middle rail. Otherwise, just drag and drop the wagons as you want. Running a train all on your own is not only tiresome, it’s also dangerous. You can find Crew in many stations and either hire them by paying or sometimes by doing quests. Every crew member has different abilities, from engineers to gunslingers. For every quest and contract you do, your crew will gain experience and level up, giving you three options to choose from. An experienced crew has many benefits over an inexperienced one, making your trips much easier. 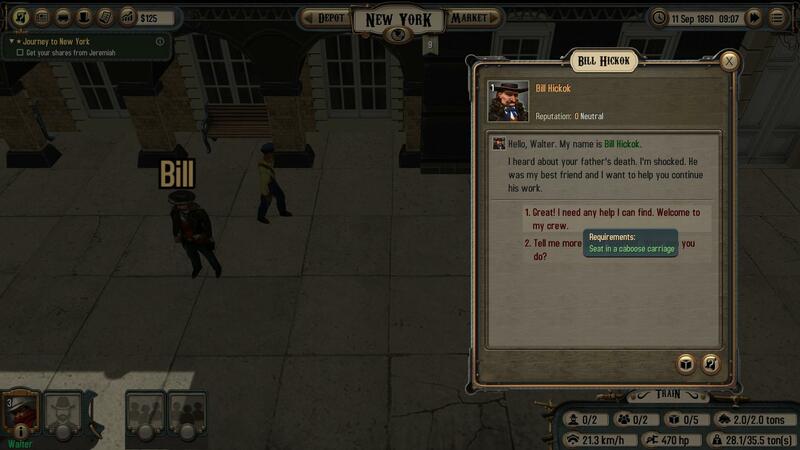 You can also find equipment like revolvers or knives to increase your chances of winning fights. 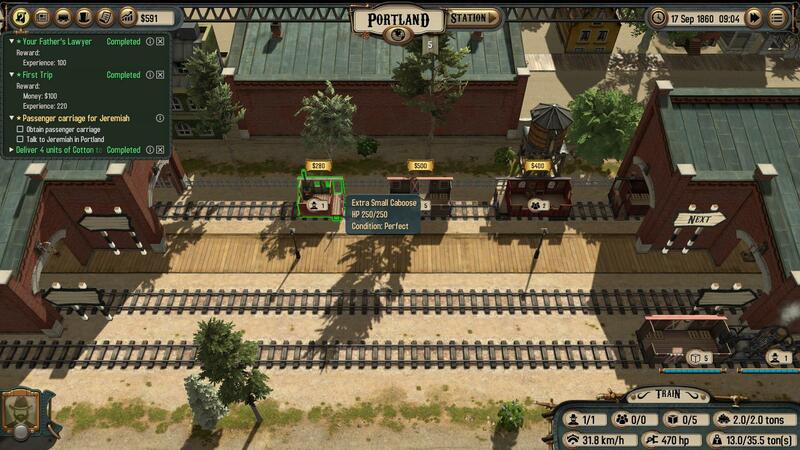 Sometimes, your train will run into special events, such as bandit attacks. In this case, you’ll get a special tactical view of the train showing you your surroundings and giving you control over everybody on your train. Bandits may try to board your train or set fire to it, so keep your guard up at all times!